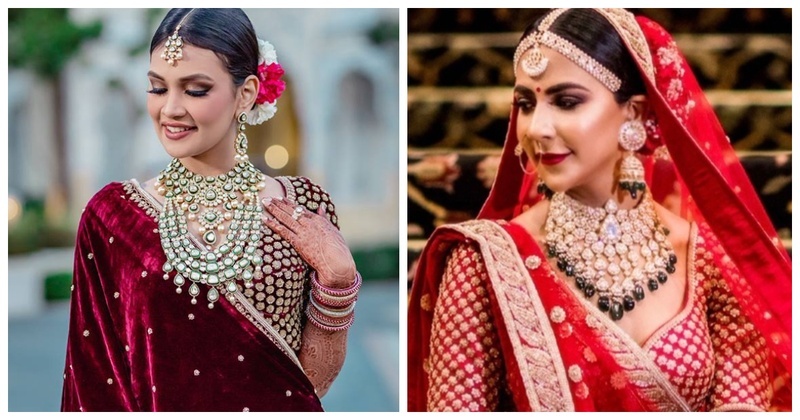 7 Classic Red Lehenga and Jewelry Combinations you can't go wrong with! It’s 2018 and red is no longer the ruling lehenga colour. But, if your heart is set on that stunning classic red lehenga, let no one tell you any other way. After all the heart wants what it wants right? A dulhan in red lehenga is definitely a vision to behold. But keep in mind that your jewellery is going to play an important part to define your whole bridal look. It can totally make or break it! Red lehenga and green is a classic combination, because of the contrast it brings to the whole look. You can opt to wear emeralds or green gemstones encrusted in a gold or diamond necklace and here’s saying, both with look ah-mazing! Or you can also, wear diamonds that do not match the embroidery of your lehenga, but instead brings out a contrast on the red color and looks beautiful! If you red lehenga has golden embroidery in it, then diamonds encrusted in gold is one way to go! This will make the jewellery blend in the whole look, and you can be rest assured, that all eyes are just on you! Nothing beats the look of an all-gold jewellry paired with a red lehenga and this temple jewelry is proof! Totally in love with how this bride has styled her all-gold jewellery. She has paired pink gemstones in her matha patti with a hint of green in all her necklaces while gold dominates her entire bridal jewellry. Stunning right? Sonam Kapoor - the fashionista bride stunned everyone when she chose to wear a traditional red lehenga for her wedding. Although, what was more stunning is the way she styled her jewelry with her lehenga. She chose to wear an all-gold choker and paired with a heavy necklace and a headgear with pearl detailing. For brides who don’t wanna go for the all-gold look, this definitely is the way to go. If you can’t decide between gold, pearls or other colours in your jewellry, I say mix-em-up. Take cues from this bride and you have got all the pointers on how to do it right! Seems odd doesn’t it? But sure does look stunning. If you are a bride who has always done things a bit hatke, this red lehenga and jewelry combination will definitely be your choice. So, what jewelry are you pairing your red lehenga with?